A Dog’s Ransom – loudlatinlaughing – Euge! Euge! 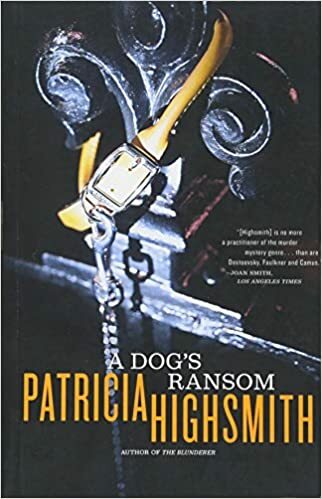 Back on the Highsmith horse with this 1972 story about a crazy NYC neighbor who delights in sending poison pen letters finally kidnapping a dog and sending a $1000 ransom request. The Reynolds are the victims, and they’ve received three other nasty letters before the ransom note. Instead of going to the police, they tie up a bag of $1,000 and hope for the best. The money is taken but no dog, since it was killed the night it was stolen by the limping Rowajinski, disabled from a construction accident that has him on permanent disability. Now the Reynolds head to the police, which is where Clarence, the bright-eyed college educated cop, overhears their story and follows up on it of his own initiative. He tracks Rowajinski down, gets a confession, then oddly leaves him to go confer with the Reynolds about next steps (Rowajinski says the dog is still alive but at his sister’s house and will be killed if anything happens to him). While Clarence is gone, R’s landlady kicks him out and he recedes to a hotel in the Village. He gets another $1000 from the Reynolds and proceeds to burn half of it so he can say that Clarence took it as a bribe. Mixed up in all this is Marylyn, Clarence’s reluctant girlfriend who he’s asked multiple times to marry him. R gets caught by one of the other officers in Clarence’s unit and immediately accuses him of the $500 bribe, but ends up in Bellevue for a few days. After he’s released, he begins to haunt Marylyn, dropping notes and threats to her that make her fed up with Clarence who ultimately chases R down one night and beats him to death with his gun. He confesses to Marylyn and the Reynolds, who have nothing but sympathy for him, but holds up under intense questioning by the police. In the end, it’s the “wop cop” that was harassing Marylyn who shows up and shoots Clarence after he refused to confess. Bizarre tale.